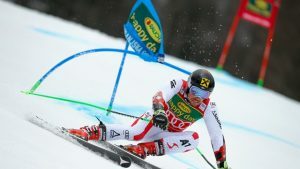 Kranjska Gora, Slovenia – Marcel Hirscher of Austria won Saturday’s Audi FIS World Cup giant slalom in Kranjska Gora, clinching his sixth consecutive overall World Cup crystal globe. A storied race that has been on the alpine circuit since it began in 1967, the Vitranc Pokal is the last World Cup series for the men before World Cup Finals, March 15-19 in Aspen, Colorado. Notably missing was Park City, Utah’s Ted Ligety, who is out with an injury, but has won at the Slovenian venue a record six times. Before heading to Kranjska Gora, only two athletes had a shot at the giant slalom globe: Hirscher was leading 96 points ahead of Alexis Pinturault of France. Pinturault, who already had a bad series at the World Championships, struggled to find the rhythm and skied out in the first run, opening the door for Hirscher. The second run weather deteriorated quickly, with a thick cloud settling on the course and rain drizzling on the racers. The snow was good—the rain working with the salted snow—but visibility was tough, causing a number of race holds throughout the second run. But the conditions didn’t trip up Hirscher. Accompanying him on the podium was Leif Kristian Haugen of Norway in second – a career best result – and Matts Olsson of Sweden in third. David Chodounsky, of Crested Butte, Colo., was the top U.S. finisher in 21st place. Chodounsky finished just ahead of teammate Tim Jitloff, of Park City, Utah, who was 22nd. Bend, Ore.’s Tommy Ford, who has only ever scored points or DNFed at Kranjska Gora, had a strong first run, finishing 16th, but went down on his hip in the second run and did not finish.